Once your dried ingredients are ready, chop up the mushrooms into medium to fine slices or chunks. If you’re adding bamboo shoots, chop them up into fine strips. Gently take it out the fish maw (it rips easily) and cut it into large, coarse chunks or strips. It’s up to you how large you’d like the pieces. I like to keep the pieces relatively large (about 3-4 inches in length and 2 inches in width) so the pieces maintain their chunky texture in the soup. The lotus seeds will need to be desprouted. Peel the two halves open and remove the small black-green sprout inside each seed if there is one. Next, take out your chicken stock and pour it into a large pot and bring it to a boil on medium to high heat. Once the stock is boiling, bring it down to a simmer on low to medium heat. Add the mushrooms, desprouted lotus seeds, and figs. Simmer for 25-35 minutes (or 15-20 minutes with a pressure cooker). If you’re adding the bamboo shoots, add your finely sliced bamboo shoots to the pot now. 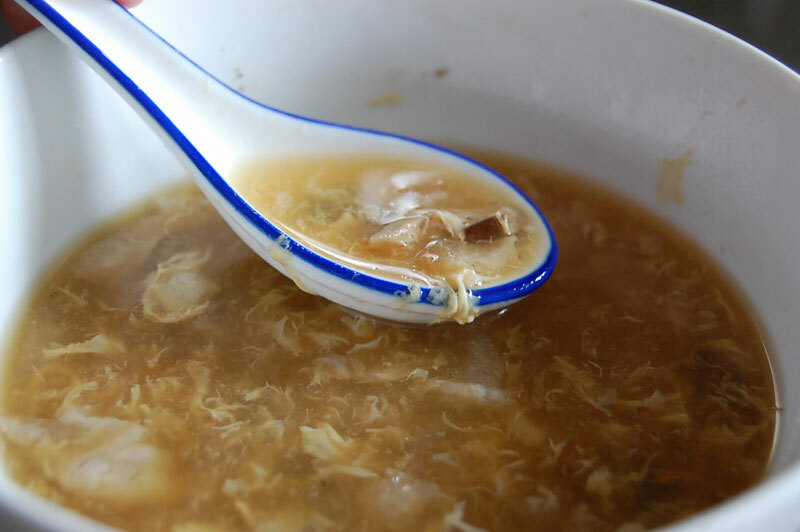 The soup should be a darker colour, and if you taste it, slightly sweet from the figs with a hint of flavour from the mushrooms, lotus seeds, and if you added them, bamboo shoots. To thicken the soup, add one scoop of your soup from the pot to a measuring cup or mug and add the corn starch, while slowly stirring. Make sure you work out any clumps of corn starch so the consistency is very smooth. The mixture will thicken – pour this into the larger pot and stir gently. Now, it’s time to add the fish maw and turn the heat down to low. 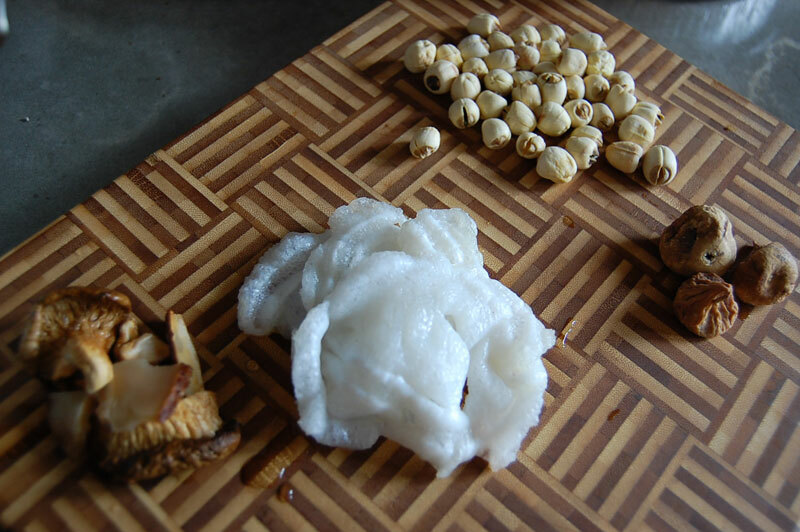 The fish maw is rather gelatinous, so on high heat, it will actually dissolve into the soup. You don’t want this to happen, so by adding it last and keeping it on low heat, you will be able avoid this. Simmer for 10-15 minutes. If you’d like to add crab meat or shredded chicken, you can add the crab meat or chicken at the same time as the fish maw. Finally, beat your egg with a fork or whisk in a small bowl. What you will want to do is very slowly drizzle your beaten egg into your pot of soup while stirring the soup in one direction very slowly. It’s important that you do this very slowly. Slow pour. Slow stir. The egg will cook as soon as it comes in contact with the soup and form beautiful fluffy strings. Add your salt and pepper to taste. Strain out the figs. This entry was posted in Soup, Starters and tagged Chinese, egg drop, fish maw, soup. Bookmark the permalink.